The Pennsylvania Dutch are known for their unique traditional foods—recipes that reflect their German heritage and agricultural roots. Experience PA Dutch cooking with the authentic Amish and Mennonite recipes found in the pages of this cookbook. Inside, are recipes for everything from apple butter to chicken pot-pie, ham loaf to classic mashed potatoes. The book is also filled with interesting facts and fun stories about many of the recipes, sure to surprise and delight any cook. Bringing these delicious recipes into the kitchen will please any family! 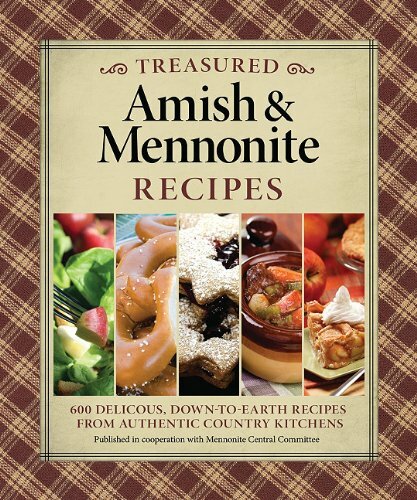 Learn a little on the Amish ways and cook like them too. This cookbook is full of wonderful gut sticking food (Oh yeah, that’s right up my ally LOL.) So let me say up front if your watching your weight this one wont be for you. You get everything from punches and drinks to soap making. You will also find some recipes for European dishes and for a huge crowd of 200. There’s something for everyone in this book. The Amish are know for the new craze Whoopie pies. I have had them years ago when I went to the Amish in Ky and always wanted to make this and now I can. The only downside is there are no pictures of the recipes but the recipes makes up for it. I recommend this cookbook to any cookbook lover. I know it will be going on my cookbook shelf when it comes out.